In medium bowl, stir together 2 cups shredded deli rotisserie chicken and 1/2 cup barbecue sauce. On large cutting board, unroll dough from 1 can (8 count) Pillsbury™ refrigerated crescents into 2 long rectangles. Overlap long sides to form large rectangle; firmly press perforations and edges to seal. Spread chicken mixture evenly over dough leaving about 1/2 inch on 1 side uncovered. Top chicken mixture evenly with 3/4 cup shredded sharp Cheddar cheese. Starting with topped long side, roll up dough toward uncovered edge; pinch seam to seal tightly. Using sharp knife, cut roll into 8 equal slices (pinwheels); place cut side down in ungreased 8- or 9-inch round pan. Bake 18 to 22 minutes or until golden brown and centre pinwheels are no longer doughy. Cool slightly, 5 to 10 minutes. Sprinkle 2 to 3 tablespoons chopped fresh cilantro over top. Serve warm. 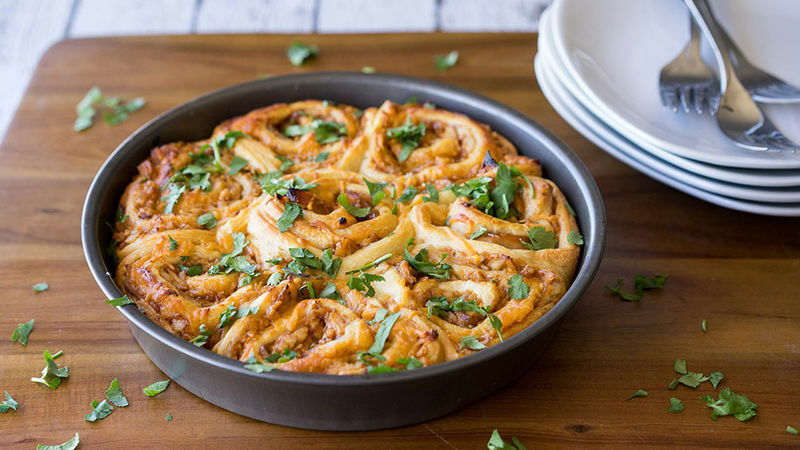 This pinwheel would work great with shredded barbecue-style pork as well. I like to serve these with a cool drizzle of ranch dressing over the top. It’s a creamy twist that is sure to please!